Months and months back, Hubba Hubby asked me where I’d like to go for my birthday. 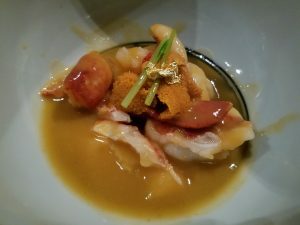 I’ll be honest – I haven’t been keeping up with trends, and I’m frankly exhausted of sitting through tedious tasting menus that seem more self-congratulatory than interested in serving food brought to the peak of its flavor and taste. 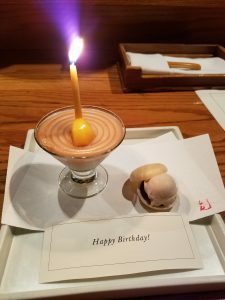 I pulled out my dusty list from years and years ago, and decided that it was finally time to visit EN – a place that many friends have visited and adored, but always was put aside by me in favor of other places. One of the reasons I’d been interested in years ago was the kaiseki menu – there are 3 options – and we chose the Aozora and were given a separate menu of just our menu to follow along as we went. Our first course – zensai – was a fun plating of all sorts of items, starting with a mini milk bottle of matcha soy milk to drink, truffle mousse, yuba with salmon roe, vegetables, grilled chestnut and kabocha tempura. 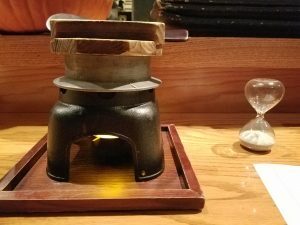 It was fun to go around the plate sampling each bit, determining our favorites and least favorites, trading those we liked or didn’t like – very unique. 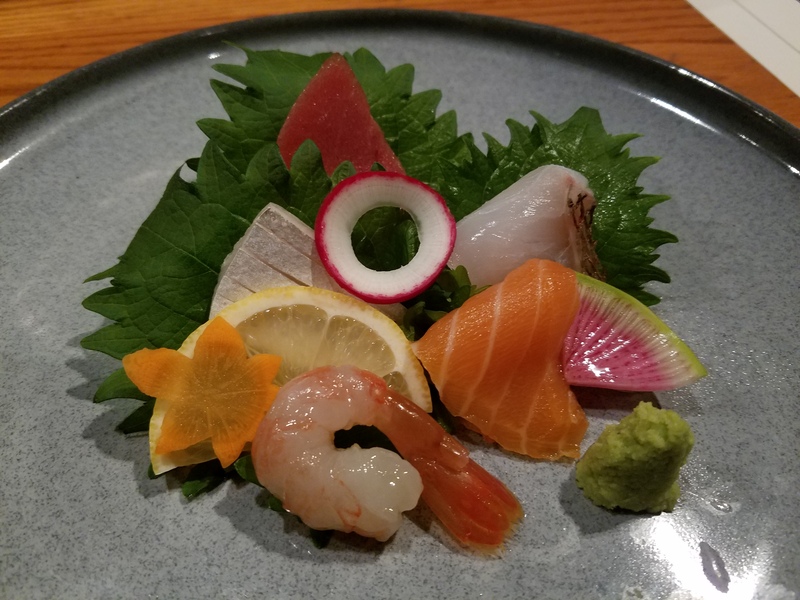 Chef’s selection of sashimi: very fresh and clean tasting – but this is sashimi at a nice Japanese restaurant and that is my baseline expectation for restaurants of a certain standard. It should be this good, or better — none of the fish offered was unique or unusual. Tasty nonetheless, just… you know, expected. Lobster with uni sauce and uni – rich, creamy, this dish was quite surprising and enjoyable. It was funny – both of us thought it was so good that we almost wanted more, but as we reached the end of our respective portions, we realized… it was exactly enough. You know how sometimes you eat something that you never want to end, but after a certain amount you think “oh, okay, that is enough” — this stopped just shy of that mark and left us wanting just a teeny taste more, but knowing that we were done because of how rich the dish was on our tongues and in our bellies. Our next course, a palate cleanser of sorts, was matsutake soup. 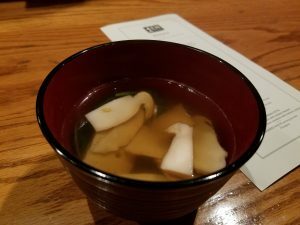 I have a personal fondness for mushrooms and their earthy yet clean taste; I’ve had mushroom tisanes that blew my mind and while this one didn’t come close to that, I still enjoyed it thoroughly. Our next course… sort of… arrived with a timer and instructions: make sure the flame doesn’t go out underneath, and watch the timer. 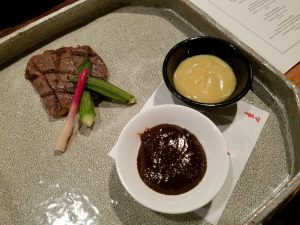 Steam began puffing slightly out of the top after a minute, but we were quickly distracted by… Black Angus washugyu beef with yuzu miso and hatcho miso. Our steaks were cooked tenderly and delicately, and while I vastly preferred the yuzu miso, Hubba Hubby preferred the hatcho miso. 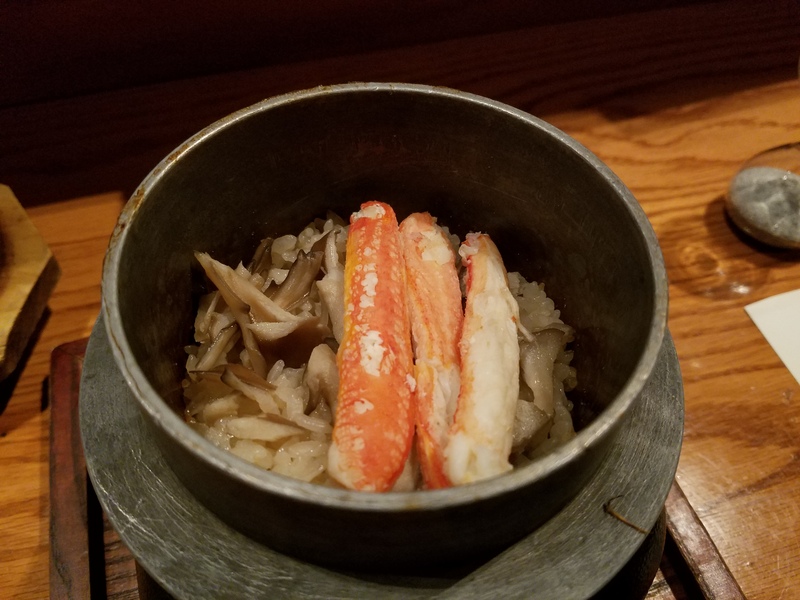 When we finished with the steak, the steaming pots atop the flame were opened to reveal: snow crab and maitake rice pot! 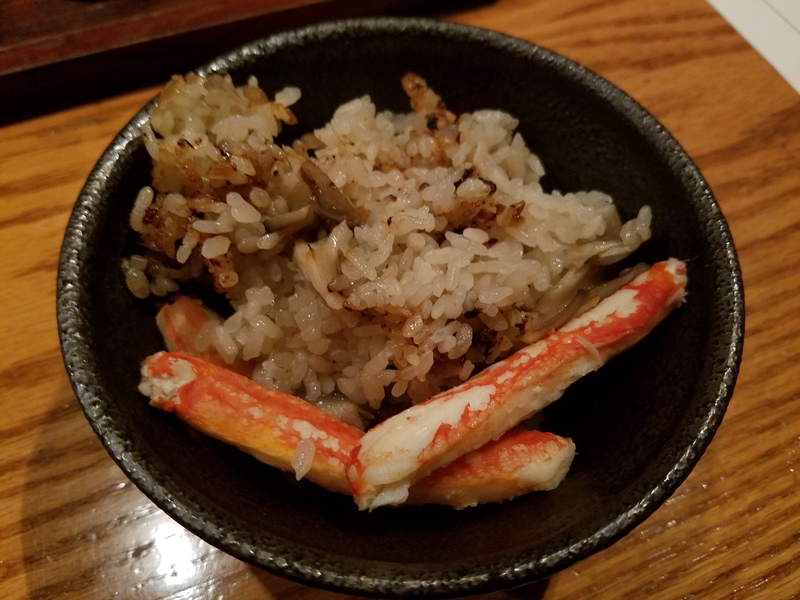 The rice was crispy around the edges, and the snow crab was sweet and tender. We were both getting super full at this point, though, so it was with welcome relief we realized this was the last savory course! Our last course … because Hubba Hubby is so thoughtful, he’d told them it was my birthday ahead of time and our dessert arrived complete with candle and happy birthday note. Chestnut cream panna cotta with a candied chestnut and an ice cream sandwich with chestnut and red bean. 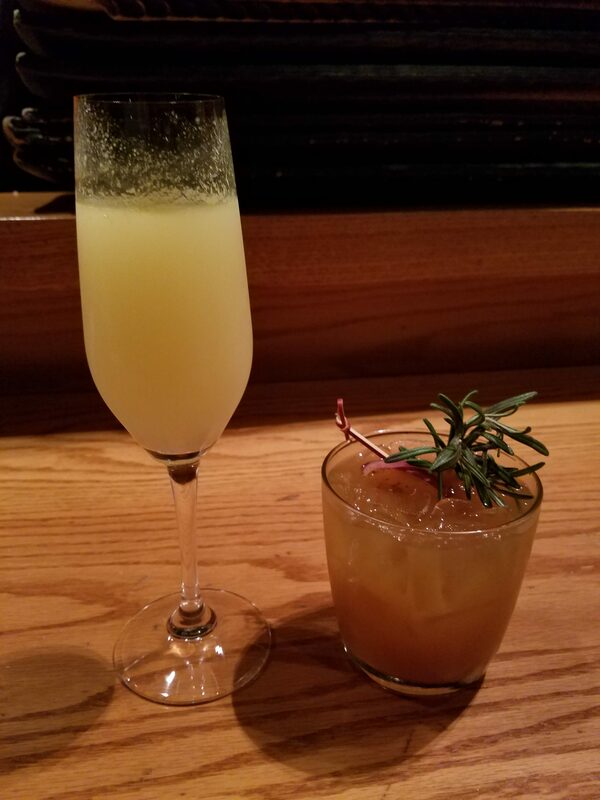 A nice, lightly sweet finish to a long, extensive meal, we were both happy and full when we piled out of the restaurant into the rainy evening. It was a great way to cap off what’d been a long, eventful day. 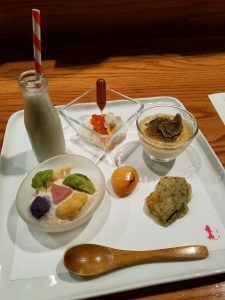 Final thoughts: while we both enjoyed our meal – the experience, the restaurant itself, attentive but not intrusive service, and the delicious food – something didn’t quite click for me. Our final bill was over $400 with 2-3 drinks total, and I don’t know — maybe my priorities and ideas of what is ‘worth’ it have changed. 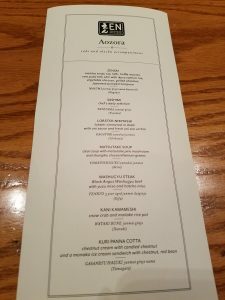 I didn’t think the enjoyment quite added up to that outlay; I don’t regret going nor spending the money – I’m happy we went and were able to enjoy it. I just don’t think I’ll be going back anytime soon.